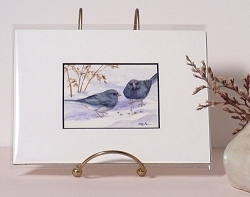 You know, around these parts, people who go South for the winter, generally to Florida, are referred to as "Snow Birds". I could never understand this appellation, because the actual Snowbirds, or Northern Juncos, stay here year round. My bird book tells me they winter to Mexico, so it must be that with bird feeders so generously supplied by all us bird lovers, they have adapted to the cold! At any rate, here are a couple of Snowbirds who did not care to make the trip to Florida and points South. 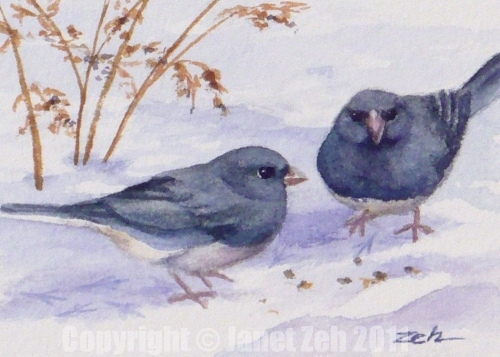 We'll call them Jack and Jill Junco. They are braving the subzero temps we are having this year and the deep and getting-deeper-all-the-time snow. Jill is on the left having just eaten a yummy seed, and Jack is on the right with one in his mouth. I'll keep my bird feeder filled to make sure this pair makes it through the winter just fine! The original painting has been sold. But this is available as a print in my Fine Art Prints shop here: Snowbirds print.